Greg Growden has covered every Rugby World Cup so we asked him to reflect upon the five matches that he most enjoyed watching and reporting. He initially produced his list in the wake of Japan's extraordinary victory against South Africa in Brighton, but he's updated the order and included a new game from Rugby World Cup 2015 now we're approaching the final. Of the hundreds of Wallabies Test matches I've covered, this is my favourite. It was a wild, tense, crazy experience. It was assumed the Wallabies would be easy victors, but the Irish have a way of reserving their best when playing their southern cousins. All game, Ireland upset Australia with good old-fashioned knuckle and clawing. And then their flanker Gordon Hamilton was off, away and heading for Dublin Bay. All of Ireland was with him, and the sprint turned into metres, with Hamilton beating Wallabies winger Rob Egerton to score just inside the corner flag. Five minutes to go, and Ireland were three points ahead. Surely, the World Cup favourites did not have enough time. Then Michael Lynagh, acting captain as Nick Farr-Jones was off the field, rallied the team behind the goalposts and explained their escape route. 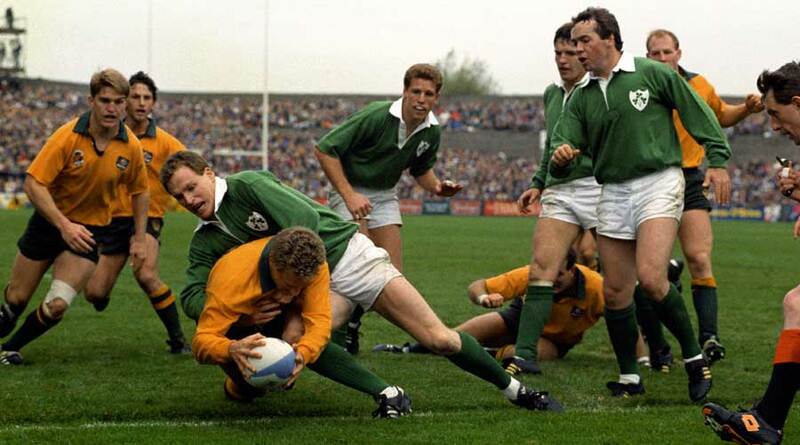 It revolved around a move they had often tried at training, and it worked with David Campese tossing the ball up in the tackle, enabling Lynagh to score. General mayhem. But Australia, somehow, amazingly, were through. It's a bit like the famous 1960-1961 cricket tie between Australia and the West Indies at the Gabba. You meet thousands upon thousands who claim they were there on the famous last day; in reality, the crowd figure was so so. Same with this epic game, which saw the World Cup taken seriously for the first time. Anyone who has followed the Wallabies for more than 30 years claims he or she was at the nondescript suburban ground Concord Oval on June 13, 1987 to witness Serge Blanco, with the score locked together at 24-all, go on an audacious run that, with less than two minutes to play, knocked Australia out of the first tournament. 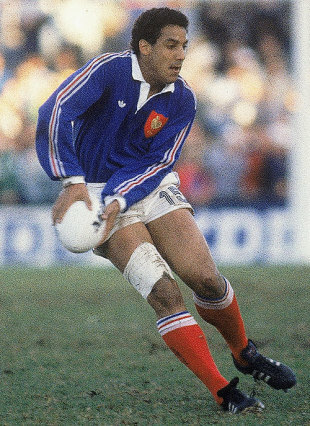 Everyone says they saw Blanco score right in front of them, after Scottish referee Brian Anderson failed to see in the lead up that France No 8 Laurent Rodriguez had blatantly knocked the ball on. In fact, only 17,738 spectators were there that afternoon - and I was one of them. I was perched behind the northern goalposts, doing a colour piece for the Sydney Morning Herald to go with Jim Webster's match report. What happened that day remains vivid. The tenacity and flair of both teams. Some strange refereeing decisions. Countless moments of panic. And the French players some time after the final bell going out to the middle of the ground, getting themselves into a huddle, and merrily singing French victory songs. The most hilarious match I have ever covered. I was sitting directly behind England coach Jack Rowell when Jonah Lomu went on an exhilarating four-try rampage. At Newlands, the press benches were just centimetres from where the England coaching staff and reserves sat. I could almost rest my notebook on the back of Rowell's skull. Lomu made the England defence look stupid, swatting them away over and over again as if they were gnats. He didn't just run around them. He also charged straight through them. The highlight was when Lomu simply ran over the top of Mike Catt; the England full-back had absolutely no idea who or what had just hit him. You couldn't help but laugh uproariously. An infuriated Rowell turned around and gave us the most venomous glares. We just kept laughing. Because the joke was on him. It was a real 'up yours England' moment. It wasn't the game that was special - but everything going on around it; no wonder ESPN incorporated it in one of their classic 30 for 30 documentaries. First up, you had the suspicion that the All Blacks had been deliberately poisoned before the game, with a mysterious 'Suzie the Waitress' accused of putting something dodgy in their coffee and tea back at the team hotel. Then a South African Airways pilot scared the wits out of everyone at Ellis Park by flying a jumbo jet just over the top of the stadium. 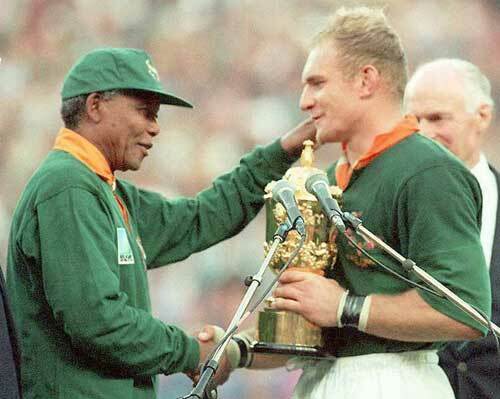 Then Nelson Mandela appeared in a Springboks jersey, walking onto the ground before kick-off for the most special of pre-match presentations. To top it all, South Africa, at their first World Cup, won the title in extra-time. There have been countless heroic Australian World Cup moments - including a deeply ill Tim Horan's brave performance against the Springboks during the 1999 tournament - but few to match what the Wallabies achieved during the final stages of their last pool match against Wales. They were down to 13 men after Will Genia and Dean Mumm had been sent to the sin-bin during the second half, and did not appear to have enough defenders to hold off repeated Welsh attacks. But somehow they did, producing a string of exceptional tackles that had the desired effect of keeping Wales out. 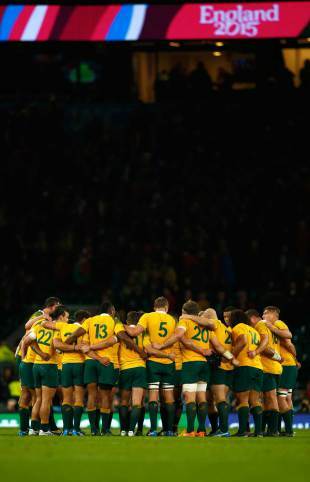 During eight excruciating minutes, the Wallabies defence did not make one mistake, rallied brilliantly, and flustered the Welsh, who were successfully herded into the middle of the field. Then for several more minutes the Wallabies were short one player, but they remained as persistent in refusing to give the Welsh anything. This victory was crucial, as it gave Australia a far easier ride through the play-off stages, and with it the final showdown with the All Blacks. This extraordinary Australian defensive effort ranks as one of the best from any international side in recent times.